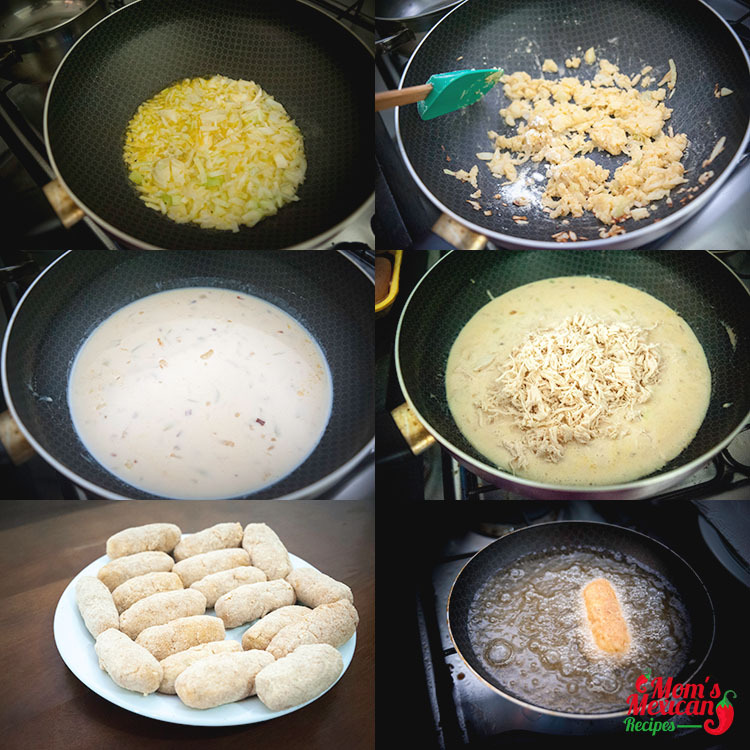 A Croquette is made by frying a food roll made of chicken, beef, veal, fish cheese, boiled eggs, mushrooms and other ingredients and covered in breadcrumbs. It is then served with bechamel or brown sauce that is drizzled on top. 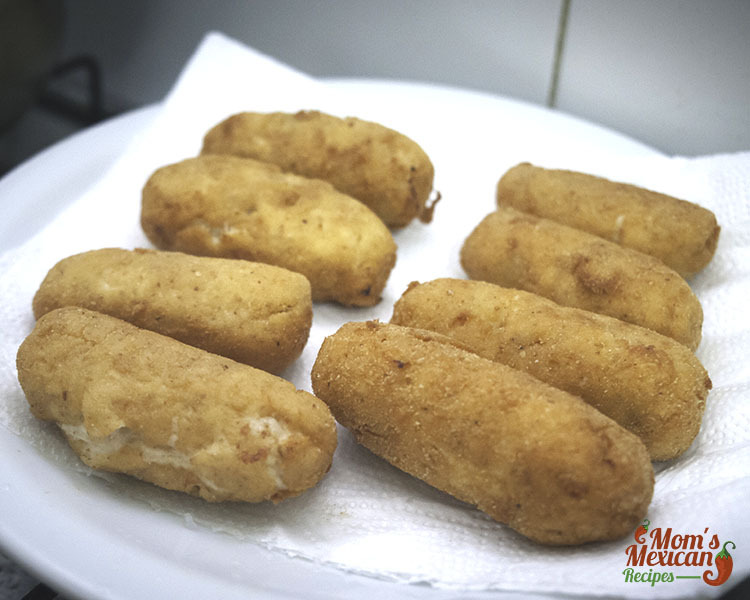 The possibilities in making croquettes are endless but for the making of Croquetas De Pollo Recipe, Chicken is the main ingredient and added ingredients and condiments like unsalted butter, Spanish onion, nutmeg, and milk make this dish special and yummy. Croquette comes from the French word Croquer or “to crunch”; in India, it is called Aloo Tikki which is filled with potatoes while in Indonesia, it is called Kroket which is also made of potato and minced meat. Heat the butter in a medium pan over medium-high heat. Cook the onions until they become golden, about 5 minutes. Add flour, mix well and continue cook for 5 minutes until the flour is cooked through and golden brown. Pour the milk into the flour mixture and cook, stirring continuously, for about 2 minutes, until you have a thick béchamel sauce. Add the chicken, and sprinkle with salt and the nutmeg, and cook for another 2 minutes. You should now have a thick mixture that you can mold in your hands. Spread the mixture on a cookie sheet to cool for 1-2 hours in the fridge. Take a spoon of the mixture and roll in your hands to make a small cylinder. 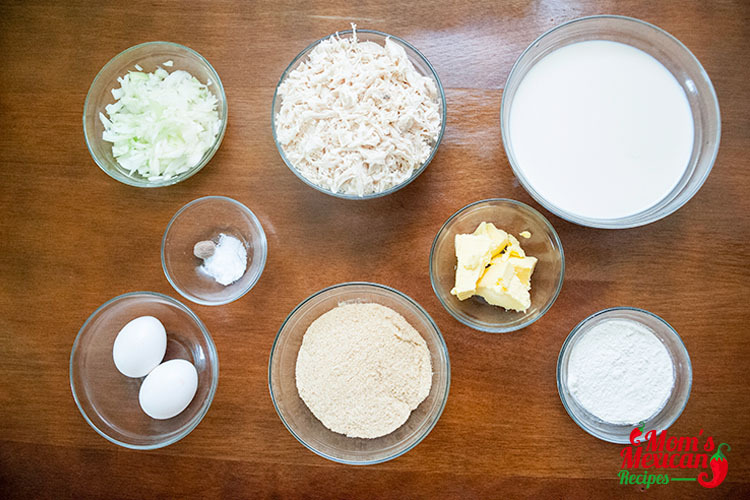 Roll the cylinder in breadcrumbs, then in the eggs, and then again in the breadcrumbs and set aside on the plate. Repeat with the remaining mixture until you have about 36 croquetas. 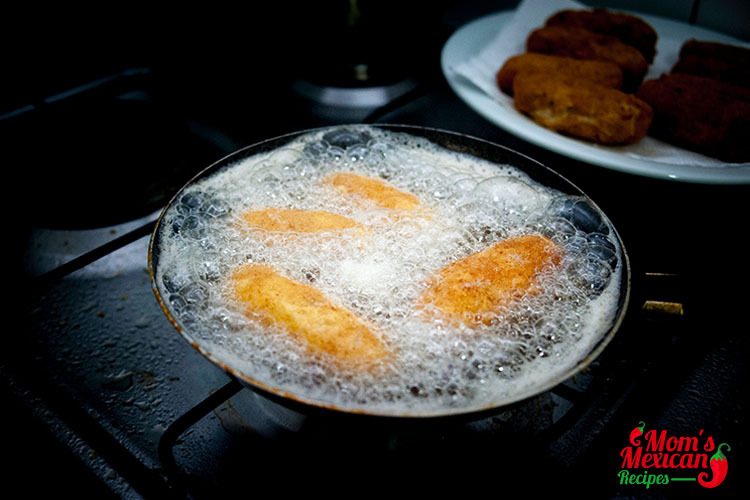 In a small deep frying pan, heat the frying oil to 375 degrees. Working in small batches, add the croquetas, making sure they are covered completely in oil. Fry until golden, about 1 minute, then transfer to a paper towel-lined tray to let drain. Season with salt and serve hot. In Spanish, it is called “Croquetas” which is where the name of the dish came from. 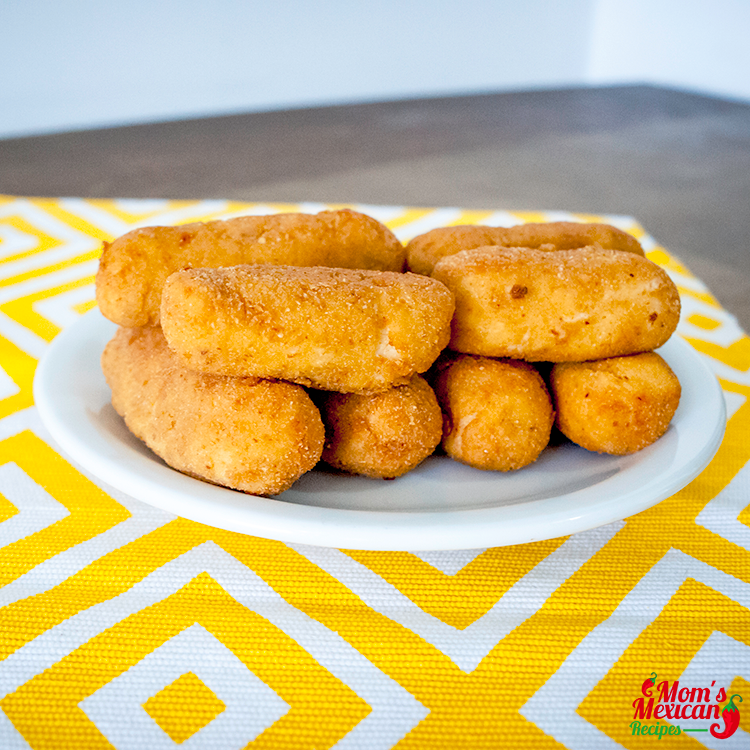 The Croquetas De Pollo Recipe is easy to make. These are small patties with packed flavor from all the spices and other ingredients that make it. The saltiness and crunch of the dish are what will attract you to it. The butter also helps with the creaminess while keeping the outside crunchy thanks to the breadcrumbs. Making this dish is a must especially if you like serving Finger foods because you can serve this along with other finger foods and drinks. To make the spread even better, try preparing two kinds of dip like Blue Cheese Dip and Creamy Tomato Dip, Green Sauce and make a simple table setting for a relaxed atmosphere with the whole family. 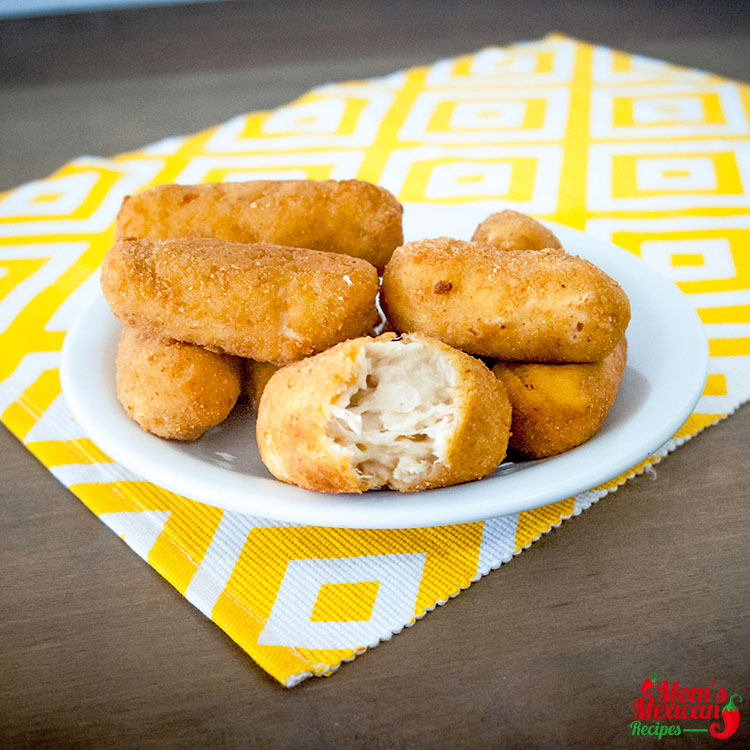 Kids will also love this dish but they will appreciate the Croquetas De Pollo Recipe more if you serve them with a ketchup dip or mayonnaise which is simpler for their palates. Don’t make this in advance because it will become soggy instead fry these tasty goodness minutes before you serve to make sure they’re hot and crispy.